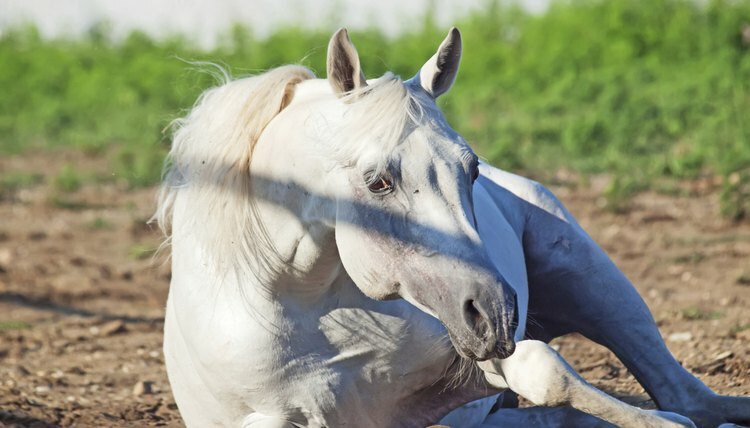 You should never attempt to use a sling on your horse without the assistance of your veterinarian, who will be able to determine the safest way to deal with your horse's physical condition. A horse sling is a piece of equipment that most horse owners hope they will never need to use and that very few individuals keep on hand. A sling is designed to keep a sick, weak horse on his feet when he is physically unable to stand on his own. Sling design varies greatly, as slings are often constructed quickly and from whatever sturdy materials happen to be on hand. The purpose of a sling is that it can be used comfortably support your horse until he is able to stand on his own hooves. Cut a 100-inch by 15-inch section of conveyor belt to create the main section of your sling. Edge the entire section of belt using your razor knife, making sure to remove rough edges and smooth potential rough spots that could irritate your horse's skin. This belt will form the primary section of your sling and will be the part of the sling that goes under your horse's belly to hold him up. Create a "Y" shaped harness by cutting part of your yard of PVC conveyor belting into two strips The strips should be 2 1/2 inches wide and 15 inches long. Drill 6 evenly spaced holes in each of the 15-inch straps using your 5/8 drill bit. You should have holes at the far end of each of your straps. Use your 5/8 -inch bolts to attach the two 15-inch strips to the ends of the "Y" on your 22-inch strip. The final piece should have the appearance of a large "Y", similar to a breast collar that is used in western riding. Drill a 3/8-inch hole in the center of your 100-inch long section of belt, near the edge. Use a 3/8-inch bolt to attach the "Y" of strips to the main section of the belt. Use your drill to put a "V" of holes at the end of each side of your 100-inch section of the sling. The "V" should start in the center of the very edge of the sling and go down and out until it reaches the sides. These holes will allow you to run the rope through different holes and angles in order to create the best result when you actually put a horse in the sling. You must also drill holes at the end of each of your "Y" sections on the breast collar part of your sling. These will be used to run rope through the front of the sling and then bring it back to the main body of the sling, supporting the horse's chest. Run your safety rope through your drill holes in whatever pattern is necessary to enable you to get your horse into the sling and get him lifted up. This will largely depend on the type of hoist you are using and the position your horse is in when you try to lift him. Make sure your rope is distributed evenly and your knots are secure to create optimal balance and security when you are using your sling.